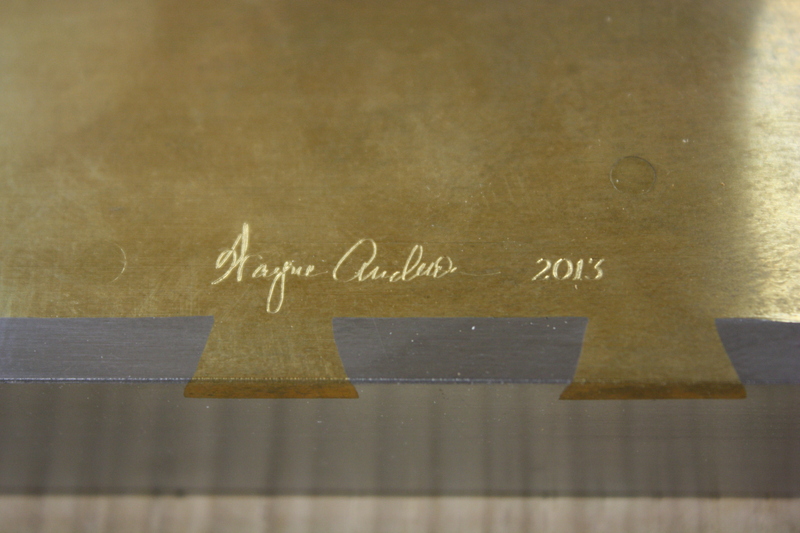 When I turned 40 last year, I decided to celebrate my life thus far with a custom plane from Wayne Anderson. It was a bit of an expense, so sometime around mid-summer of the previous year, I printed out Chris Schwarz’s article about Wayne from back in 2008 (I think) and stuck it up on a wall in my office at work (half the walls are there; you have to imagine the other half… and the door). Then, I stuck a Post-It note next to it with my target goal and started saving. Sometimes it was gift money and sometimes it was money earned by selling something I’d made or some tools I didn’t need or want; either way, it all went into my secret stash spot (undisclosed for my protection). I crossed off the total and updated the Post-It until I had enough, then I placed my order. Well… it didn’t exactly go THAT easily. I also picked up the wood I wanted Wayne to use when making my miter plane and shipped it to him for confirmation that it would work. After that, there was a lot of back-and-forth with him as we planned out the details of what I wanted. In the end, I told him what style in which I wanted the plane made. I told him I wanted a plane that would be uniquely mine. I gave him a few extra design ideas, but then I put my faith in the hands of the artist and let him make the plane how he saw fit. The final result was breathtaking. For me, “fun” is being surrounded with tools that speak to me and are comfortable to use when I’m in my shop. I like tools that are personal (or personalized) and for which I have an affinity, because of how they were made, what materials were used, or where they are from. This is why almost everything I own from Blue Spruce Toolworks has a custom curly mahogany handle on it – I sent Dave Jeske the wood I wanted him to use from my own personal stock of curly mahogany I’d gathered up over the years. 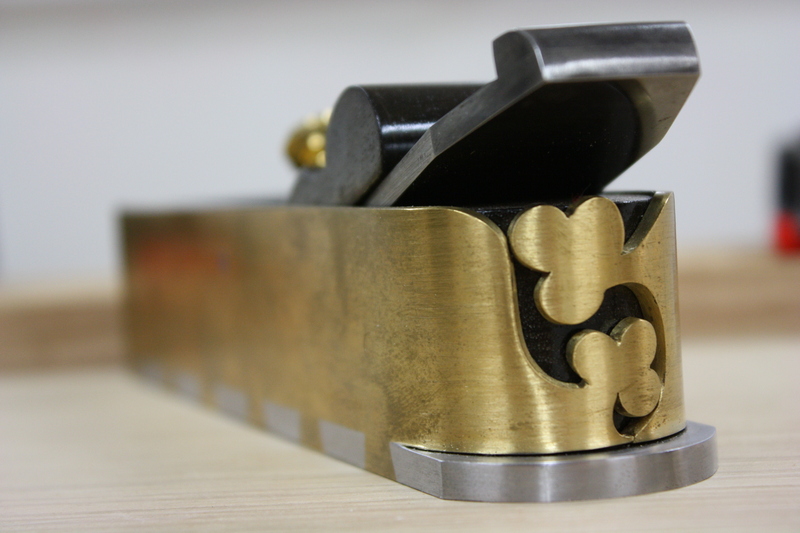 This is why my favorite slitting gauge is 120 years old and made out of English boxwood with a wonderful mellow patina. This is why my favorite saw is a 100 year old Tyzack dovetail saw that fits my hand like a glove. It is the same with my Wayne Anderson smoothing plane. The infill and wedge are made out of bog oak from the west of Ireland, the same Irish county as where some of my ancestors have come from, as I understand it. The shamrock cut-outs in the back are also a reflection of my Irish heritage. The wood selection for the infill is further significant because I use reclaimed bog oak in many of my projects. The second I unrolled the last bit of bubble wrap from this plane and held the plane in my hands, I had something of a spiritual connection with it. 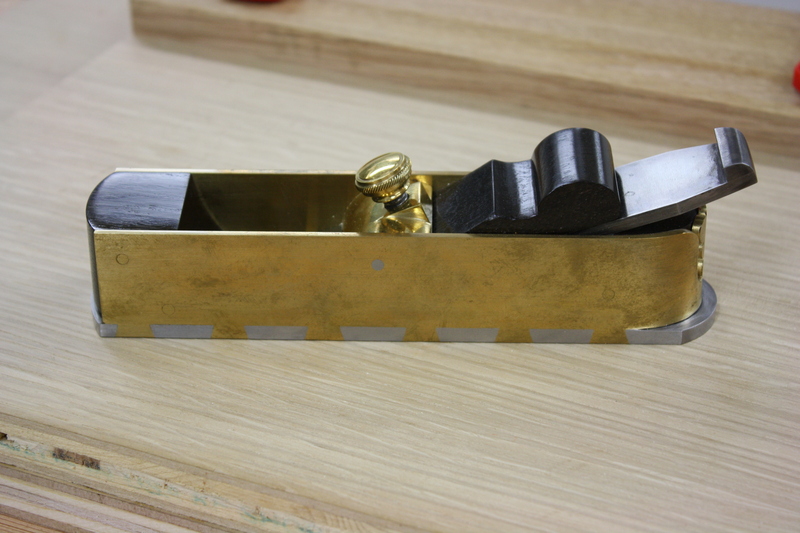 It felt “right” for me to use this tool to aid me in making things with my hands. That kind of feeling is not very easy to describe; I don’t think you can fully understand it until you’ve felt it. I’ve had the plane for over a year now, yet this is the first I’ve officially said anything about it in blog-form. When I get a new tool, I like to give it fair amount of time in the shop before I write something up about it. This is sometimes a challenge, especially when that tool is so amazing I want to stand on a mountain top and shout its praises! Although first impressions are important, I don’t want to just talk about appearances; I’ve had tools that looked great but their performance was mediocre at best. I want to be able to discuss how it performs and how it sets up and how I use it in the shop, in addition to the fit and finish. When I got the plane home, the first thing I did was crosscut a piece of walnut to clean up the end grain. Man, it was such a good feeling to take a tool that was designed for a specific purpose, use it for that purpose, and have it work exactly the way you expect it to. 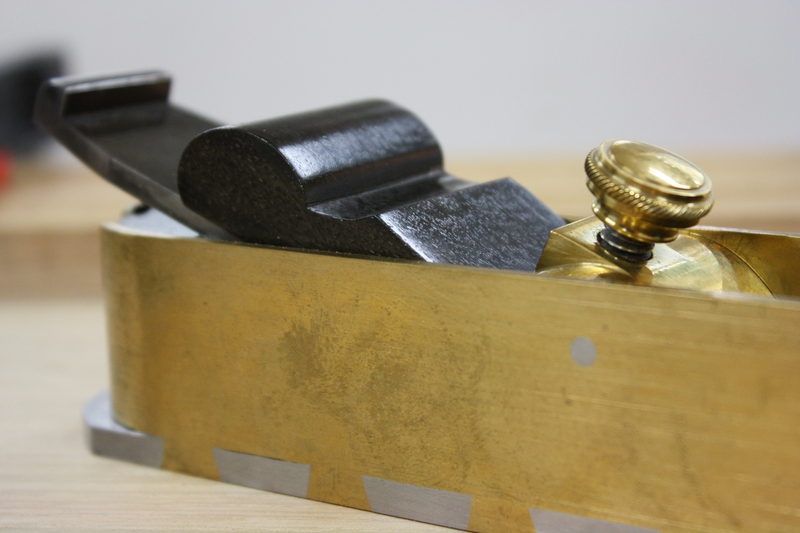 To make myself comfortable with it, I removed and set up the plane iron several times before I sharpened the blade. 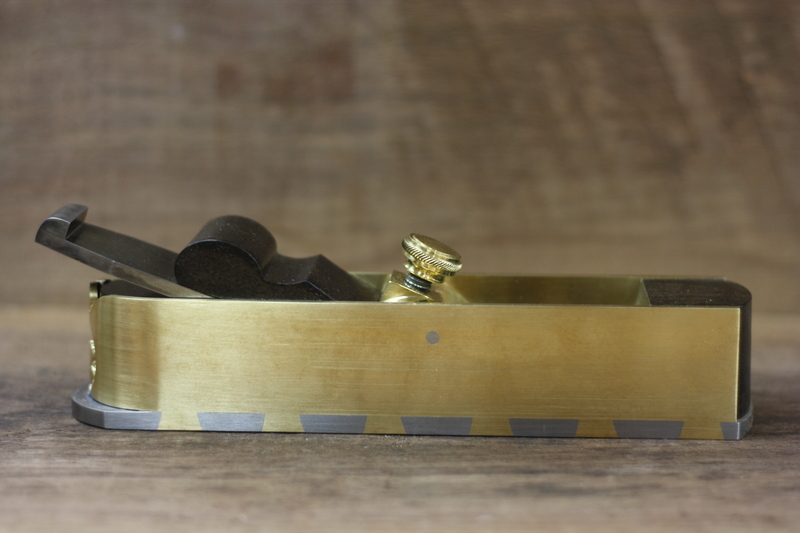 With the way Wayne designs his lever caps and uses them in combination with the wedge, I had the blade set up and taking end grain shavings again in a matter of seconds, it was that easy. Since then, I’ve taken it apart and put it back together about 10 times now, even though I’ve only had to touch up the blade once. I’ve also used it off the shooting board and it works just as well. 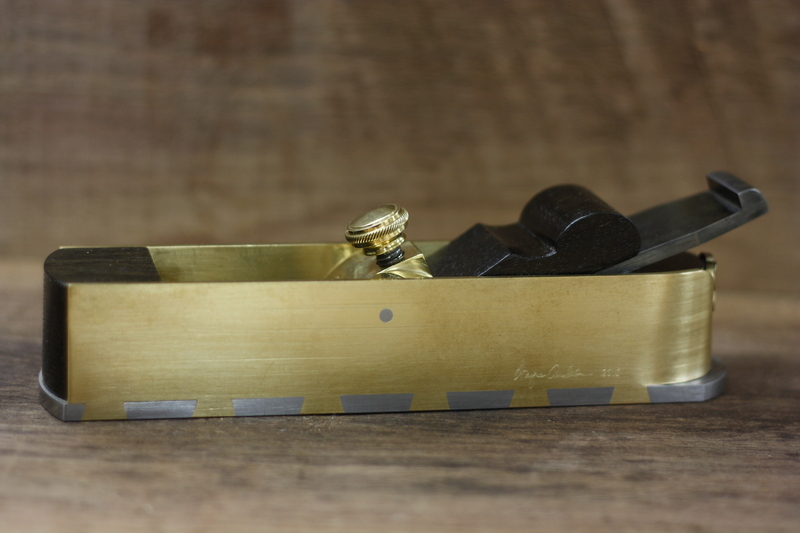 I have a finely-tuned Stanley low angle block plane that was my go to plane for end grain for many years. I tried to compare the two side-by-side, but it just didn’t seem fair. 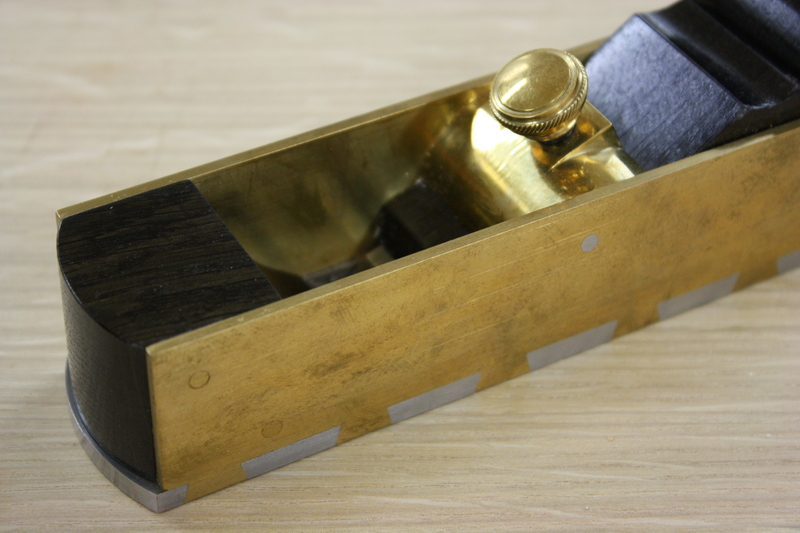 The miter plane out-shined the lighter block plane in every test by a huge margin. 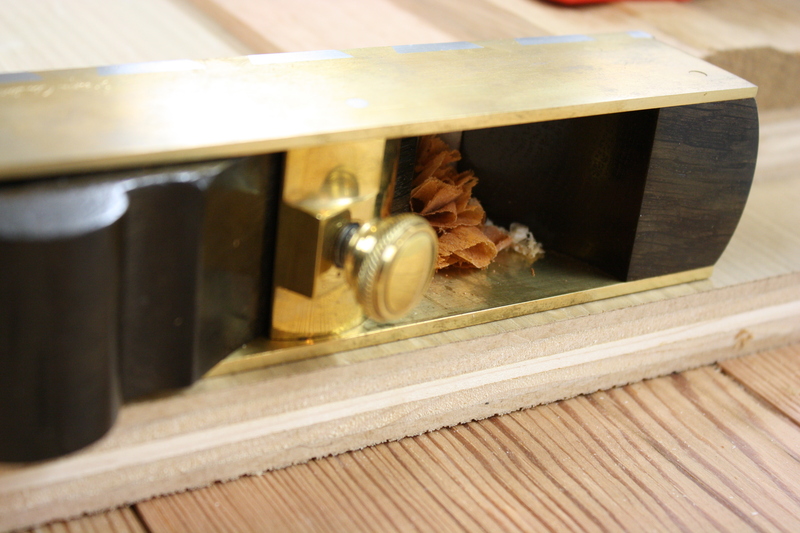 I still use the block plane in some instances, though, like when I had to do some on-site work at Finley’s school the other week. I guess I’m not quite comfortable taking my miter plane out for walks just yet. So my love of this plane isn’t purely for aesthetic reasons; there are certainly some mechanical advantages to the heavier miter plane. 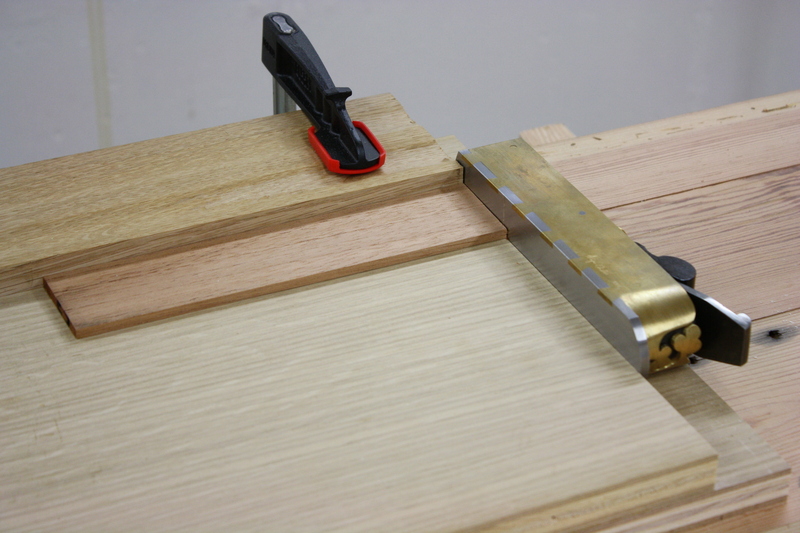 For me, it’s a complete package, a combination of ease and comfort that makes my woodworking more enjoyable. You can add to that the fact I am the owner of a completely unique piece of woodworking history. I could set my plane down on a table with 150 other Wayne Anderson planes and immediately pick it out from the others. Plus, barring some extreme trauma or apocalyptic event, I have the only miter plane I will hopefully be using for the next 40 years. After that, my son will finally be able to touch it and can use it for as long as he wants, as well. I’m sure others will find they get the appropriate level of enjoyment out of their woodworking without having such a plane in their shop. I understand that; I get it. There are people out there who cook on a $1500 grill and need (relative term) a $10,000 Man Cave in order to watch sports with their friends. I don’t belittle them for spending their money on what they want, even though I do just fine with my $125 grill from Walmart and a moderately-sized flat screen TV in a regular old family room. I don’t waste any time wondering if those people would belittle me for my “extravagant” plane. To be honest with you, I don’t care. This isn’t their hobby – it’s mine (see paragraph 5). I guess the only drawback to my miter plane is that now I have the desire to show up at the next Wayne Anderson Plane Reunion. And I can pretty much guarantee you I’m not going to wait until my 50th birthday before I send Wayne some more wood and a check for another plane. This time I have my eye on one of his smaller smoothing planes. It will be worth every penny I’m already starting to save. ← Oh, You Made Contact! Outstanding, Ethan! Enjoy that plane and enjoy making things with it. Thanks, Rob! It is nice to have a few tools in the shop that do what you want them to do every time they’re asked. I think one thing that will increase my use of the plane will be a donkey-eared vise. That will help truing up miters on some of the boxes I make a lot faster and easier. Know of any good plans for that? Very nice. Enjoy it for the next forty! I have no doubts that I will! Beautiful plane (like the shamrock detail) alongside a wise, tolerant attitude re: “extravagances” that I wish more people would take. Amortizing your tools vs electronics or season tickets or new car every year or craft beer or shoes or travel,,, over time shows that those in similar circles spend similar money in different directions that others may think silly and so long as we can afford it, we should all just be genuinely happy for each others joys. Thanks, Jeremy. Well-said on your part, as well. The other message I tried to portray a little of is the idea of saving up for something you want. I didn’t put anything on a credit card or take money out of savings or sneak anything out of the family budget. I saved and worked on a few extra projects and sold some things I didn’t need and I didn’t spend the money until I already HAD the money. It is a rare concept, to be sure, but one I have to practice if I’m going to preach it to my son.